An in depth analysis of the recording and production process behind Shane Berry’s remix of the Aural Imbalance track – Into Space. In late 2012 I was invited by UK based drum ‘n bass artist, Aural Imbalance, to remix a song titled “Into Space” off his full length album “Legacy”. Aural Imbalance (aka Simon Huxtable) and I have a long standing working relationship through our mutual record label, Greta Cottage Workshop, and I have produced several deep techno remixes for him in the past. This particular remix is to accompany the release of his album in mid 2014 as part of a supplementary CD compilation of remixes by guest artists from varying musical genres. The label co-ordinating and releasing the music is UK based label movementinsound. Initially, I produced two remixes of “Into Space” for Simon by early 2013 – first, a breakbeat re-work with a prominent synth bassline and second, a deep, moody techno track – but he was fond of neither. He asked if I could take the synth bassline and re-arrangement of his pads and melody from the breakbeat version and marry that with the 4/4 electronic drums from the second remix. At that point, the remix was put on hold and I did not hear from Simon for a number of months. In early December 2013 I learned that the jazz trio I had planned to work with for my final recording project for SAE could not commit to the project, so I started to look for alternatives. It was around this time that Simon inquired after the progress of the remix, and I realised it would make the perfect challenge for my final exam. I know that Simon was not after a breakbeat/drum ‘n bass track from me, but I still wanted to to incorporate an aspect of his style into the remix. I decided that, instead of using drum ‘n bass as a genre, I would use actual drums and bass instead – a sonic pun if you will. This concept covered all aspects of the final recording exam and the remix. It required me to record live instruments (meeting the criteria of the SAE exam), and it allowed me to pursue the artistic vision I had begun to flesh out in the breakbeat iteration of the remix: acoustic drums and warm bass contrasted with a hyper edited and programmed electronic music arrangement (meeting the criteria of the remix commission). I would be co-ordinating deadlines and schedules between myself, the label, the artist, the studio musicians, the professional recording facility, Pink Studio, SAE and my classmates. I would have to deal with copyright clearance and permissions from the label and SAE. It involved producing, recording and arranging music in the analog and digital realm. The final result would have to meet commercial release standards. I would have to document, justify and explain every step of the process. I approached Prof. Bojan Neskovic, head of audio at SAE, Belgrade, and sought permission to use the remix as the basis of my final recording exam, and once I had his approval I contacted Aural Imbalance and movement insound’s label manager to pitch the concept to them. They cleared the remix for academic use, and I moved ahead with the project. Through contacts at SAE, I was able to procure the services of two of Serbia’s leading live and session musicians – bassist/guitarist Slobodan “Lima” Vasic and drummer Alek Petrovic. They are both highly respected and active musicians on the European music scene working with some of Serbia`s top recording artists such as Eyesburn, Bloodbath and Milligram. Produce and arrange a new remix based on feedback from Aural Imbalance. 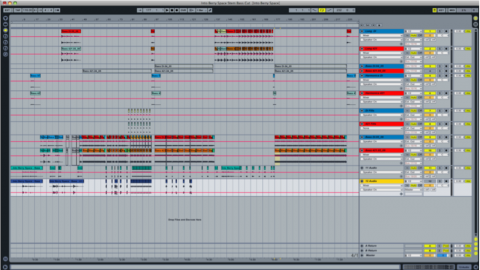 Prepare the new remix arrangement as a guide track for the musicians. Prepare 8 stems of the remix arrangement for a mixdown on the SSL 6000 E.
Arrange and record acoustic drums and a live bassline against the guide track. Polish and micro-edit the remix track along with the acoustic recordings. Arrange and mix the acoustic recordings and electronic elements into a final remix track. Prepare the final remix track for pre-mastering. Deliver the final remix within a fixed timeframe for approval and mastering. With a hard deadline defining the whole project, I drew up a production schedule and music brief for the artists and set about booking studio times at SAE and Pink Studio. Once I had confirmed the musicians’ schedules and availability, I finalised the production schedule, and started producing the new remix. I booked two main recording sessions, one at SAE Digital Studio, and one at Pink Studio. In Logic Pro 9, with Ableton 8 Suite in Rewire mode, I merged the two original remixes into one new remix making use of the underlying arrangement structure that already existed in the breakbeat version. I also lowered the tempo from the original 160 bpm to 116 bpm. I chose 116 specifically because it’s a homophone of 160. I removed the breakbeats from the first remix, extended, programmed and re-arranged the synth bass line throughout the new piece, and set about designing the sounds and new arrangement for the electronic drums with the express consideration of acoustic drums being mixed in later. This was the first guide track sent to both musicians prior to recording, and this arrangement remained unchanged through to the end of the project. The bassist was unable to attend the Pink Studio recording session and was tracked during a rehearsal/production meeting one week prior in the SAE Digital Studio. Once I had arranged the bass recordings from the SAE session into a single musical bass line, I bounced an updated version of the guide track and sent it to the drummer. To assist the drummer even further, I recorded a separate vocal track containing numeric countdowns and timing instructions to indicate important changes in the arrangement. It was to be played alongside the click track via the Stereo Cue mix on the SSL labeled Vox Guide GT. The bassist’s inability to join the Pink Studio recording session opened up a time frame to attempt a mixdown of the whole remix, along with the freshly recorded drum takes, on the SSL. In preparation for the SSL mixdown, the remix consisting of 24 tracks was divided into 8 basic stems in Logic and bounced to disc. Two weeks prior to the recording session at Pink Studio, I forwarded a full production schedule and project brief to both musicians (See Page 6 – 8) along with the first version of the stereo guide track. Traditionally, as an artistic imperative when working on remixes, I endeavor to use at least 75% – 85% of the original remix materials provided, adding only drums, bass and synthesis when desired. 90% of the sound design, therefore, is based on and around as much of the the original sound sources as possible. The idea for this remix is to bring together several genres of music and modern music production concepts under one project – the EDM remix, based on 24 Bit/44.1KHz samples provided by the artist, Aural Imbalance, rearranged and mixed by Shane Berry as a basis, and acoustic recordings of traditional rock/pop instruments played to the guide track and mixed in with the overall final song. The key words for this project are space, depth and journey. Every single sound element is treated. Each principal sound will start in one space and arrive in another. Some completely altered, others imperceptibly so. Each individual sonic journey culminates in the larger journey of the whole piece which never increases in tempo, but intensifies and evolves to an uplifting but discreet crescendo and falls into a minimal outro. 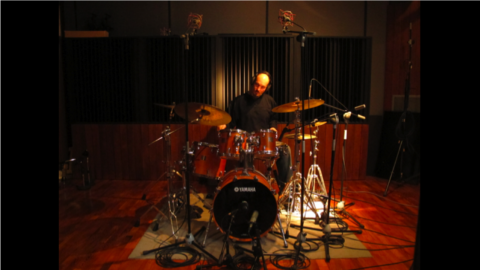 The acoustic drums are conceived to follow almost a history of music, starting out earthy and tribalistic and, from there, the song moves into deeper territory. The track will gradually increase in intensity much like a composition and recording by the band Tool or Godspeed You Black Emperor, but maintain a sense of space and depth all the while. If time and resources permit, an acoustic contra bass or electric bass will be encouraged to improvise over the added analog synth bass line and discreet guitar parts will be layered into the soundscape. Less is More is a fundamental idea for the music itself, and a minimalist approach to both production and recording sensibilities will be adhered to whenever possible. Ideally, a contrast will be drawn against the acoustic and sampled material in that all acoustic/recorded material will be single, unedited takes whenever possible. Mission: Acoustic recording of drums to 8 Channels against guide track ending with a leveled and lightly treated mix of drums and remix stems summed to at least 3 of the SSL Stereo Output Busses and tracked as stereo stems back to tape. I/0 follows standard one to one arrangement for input, desk and final mixdown workflow. 2 x Neumann U87s measured equidistant from between the mounted toms (as opposed to equidistant from snare) to cover a wider area of the drums and compensate for lack of close mics on toms. U87’s were placed quite high to allow for a spacious feel rather than a tight “Pop Sound”. This is a deliberate production choice since the tight “Pop Sound” of drums will come from the programmed electronic drums of the remix and the acoustic drums will “sit behind” the electronic drums in the final mix. There is no intention to make the acoustic drums take an upfront role in the mix. As in the concept brief, space and depth are key concepts in mic placement and mic choice. Ostensibly, the overheads will be the most obvious element (after the snare) of the acoustic drum recording, and accordingly they got the most attention and time for setup. 1 x EV RE20 placed in hole and angled +/- 30º to the right inside side of the kick drum after a satisfactory deep drum resonance was located along the inside wall. 1 x AKG D112 placed dead centre of kick about 6 cm from the vellum and raised about 5 cm to pick up a nice “thup” located by sweeping the mic slowly through a vertical arc in this position. The kick was the least important aspect of the recording simply because it was never intended to be mixed into the final track (and wasn’t). 1 x SM57 placed in a zone of air pressure located with hairs on knuckles about 3 – 4 cm above, and 1 cm in, from the rim. The snare was muted with a strip of folded and pinched masking tape to dull any untoward resonances. The snare was destined to be quite upfront in the final mix, so attention was paid to making it snappy and punchy, but it was still “given some space” so to speak. 1 x SM57 was placed about 10 – 15 cm below the snare to create more than a 1 to 3 distance relative to the top SM57 and angled to avoid phase issues with top SM57. Again, the idea was to get quite a spacious sound out of the snare itself hence its unconventional distance from the bottom of the snare. 1 x AKG C451B was placed 30 – 40 cm above pointing directly down and 4 cm or so off centre away from the snare/drummer. The recording was aimed specifically to blend in with an electronic dance track in the final mix, and the C451B was chosen for its characteristic bright and airy sound. 1 x Rode NT2A was used to possibly bring an even more spacious feel to the room, but in retrospect it was not well placed and hardly used in the final mix. The drum kit was placed sideways to the studio glass, centered between the (now) side walls, and pushed back up against the (now) rear wall. This placed diffusers directly behind the drummer and “in front of” the mic array greatly diminishing any room sound and leveling out high transients from the cymbals. Acoustic dividers with their wood and glass panels facing inward towards the drum kit were used to close the space but to keep the “air” in the room – the aim for the recording was space and depth (not large and reverberant) – so the fact that the rear of the dividers are absorbent meant late reflections and reverberations were greatly diminished, and a clean yet spacious drum sound was possible. The live bassline was tracked at SAE on the Yamaha 02R96v2 into Pro Tools HD 9 via Active DI, and the school’s Fender bi-speaker bass amp was close miced with a White Sennheiser MD421. The mic was first placed directly in front of the amp’s right speaker cone and then slowly moved to the right,on axis, until a sweet spot was located. The aim was to capture a warm, rich bass sound with elements of reggae dub, funk and rock. The bassist brought two bass guitars to the session, a Custom Yamaha and a traditional Fender Jazz Bass. The Fender Jazz was used because of its characteristic warm and present sound. The volume knob of the amp was turned up to around four, just at the threshold of amp’s tendency to overdrive beyond this point. This setting maximised SPL to mic, but kept the acoustic signal clean and powerful. The bassist adjusted the onboard equaliser of the amp and his own bass to taste. The bass amp itself was placed under the studio glass about 20 cm from the wall and turned 90 degrees to fire into the corner of the studio about 90 cm away from the angled wall it now faced. This was to minimise room modes by avoiding any direct sound hitting parallel walls. The amp was also raised off the ground to prevent too much of the “floor” entering the mic. Further acoustic treatment came from placing the flat side of the school`s triangular acoustic baffle at a right angle to the amp “closing” in the mic position from both sides i.e emulating a very small dead room to mitigate room sound from the SAE Digital Studio. The original idea was to record a bassist playing a single take against the synth bassline of the remix, but this proved difficult to do because of its slightly unorthodox timing and tuning. It was decided to expedite time available with the bassist and record him jamming a few riffs and licks against the guide track, and then have me compile the audio fragments into loops after the recording session. This proved beneficial, because the drummer (who was present at the session) managed to rehearse numerous times against the guide track, and get to know the material better, and the bassist was freed to be more creative and relaxed resulting in some recorded material perfect for looping and editing. While editing and compiling the bass in Ableton Live Suite 8 (Rewired into Logic Pro 9) (Figure 1), it quickly became apparent that the live bass and synth bass were never going to work tonally or musically. A decision was made to split the remix into two versions, a purely synthetic version (keeping the original synth bass line and electronic drums), and a new version with the live bass replacing the synth bass. The bassist, not entirely satisfied with his performance, recorded a few more bass lines at his home studio and sent them to me via web on the Sunday evening following the SAE session. Once I had incorporated his recordings, and had all the material edited and arranged against the remix (minus the synth bassline), the bass clips were consolidated into a single mono track via Rewire through Logic Pro 9 and bounced to disk. The new mono track was placed in an updated version of the guide track and sent to the drummer two days prior to the Pink Studio recording session (see schedule). For the Pink Studio recording session, the remix was separated into 8 Stems and this mono live bassline stem, named Bass GT for the session, was then run through the SSL 6000 E Desk and an LA2A leveling amplifier, and re-recorded to Pro Tools HD 7. This is the live bassline that appears in the final mix. The decision to use Ableton, not highly regarded for its sound quality, to edit and compile the bass parts was to expedite production of the updated guide track for the drummer. The live bassline needed to be ready within 24 hours after recording, and my familiarity with editing in Ableton facilitated this deadline. With intimate knowledge and many years of experience working with Ableton, great care was taken in using warping algorithms that generated the least artifacts, and no warp markers were used unnecessarily, if at all. Furthermore, the Ableton session was rewired directly through Logic Pro 9 to avoid using the Ableton stereo master bus out and audio engine. During recording, the SSL 6000 E Desk was set to Record Status VCA to Monitors in order to facilitate a mix of the four output busses (A, B, C and Programme) to tape as per the given studio schedule (See Page 9). Of course, recording with VCA to Monitors means that switching desk to Mix Status means the VCA faders are already in mix positions from the monitor mix of the tracking session, and very little, if any, leveling should be necessary freeing up time for patching to outboard gear and focusing on light dynamic processing. Given the drummer is an experienced professional, who had rehearsed with the guide track and attended a mock recording/rehearsal session (See Production Schedule), this timeframe was more than realistic and, indeed, realised. It was also a sonic decision to have the recording go through small faders which have a slightly edgier sound over the VCAs, and would lend to a more present sound for the acoustic drums in a dance track. Since the original remix files from Aural Imbalance were 24 Bit 44.1Khz, the Pro Tools Session was set to the same to avoid unnecessary conversion and down sampling between bitrates. A stereo cue mix was quickly set up with a click track and separate vocal countdown guide track alongside a stereo mix of the 8 guide track stems prepared for the session (see Desk I/O). Alek played three takes in quick succession, and by the third it was evident we had already achieved the objective of the session. Before Alek departed, we recorded a few “single shots” around the kit just in case I needed single elements of the drum kit when I edited the acoustic drums against the electronic drums in the mixdown. We wrapped up recording acoustic drums exactly on schedule. As planned, basic levels for the stems and recorded acoustic drums had been reached on the VCA monitor path during tracking so, when switching to Mix Status, there was little to no adjustment of the faders. It was decided that, of the three drum takes recorded, take two was the best, so all mixes were done with the second take of the drum session. The electronic drums were muted for all SSL Mixdowns. For the first mix I only mixed the acoustic drums and live bassline to tape. To begin with, I patched the live bassline through the Teletronix LA2A leveling amplifier (via Channel Insert) and routed it to Mix Bus B (Mono). I then routed take two of the acoustic drums to Mix Bus C dry. Take two of the acoustic drums was also routed via Matrix to two spare channels. We patched in the DBX via channel inserts and added some reverb via Aux 3. This compressed and reverbed signal was routed to Mix Bus A. The Programme Bus Compressor was engaged and set to “pump” to the tempo and groove of the track. Via patchbay, we patched Busses A, B, C and Programme to Multitrack Sends and Group Monitor Inputs, created three stereo tracks and one mono track in Pro Tools, and recorded SSL Mix One to Tape. Same as above, minus live bassline track leaving only acoustic drums. Same desk settings as previous mixes except all acoustic drums (dry and compressed) are routed to Bus C. Live bassline remains patched through LA2A on Bus B (Mono), and Bus A is now harmony and melodic content with a touch of reverb via Aux 3. Programme is the sum of all three busses through the Programme Bus Compressor and master VCA fader. When polishing the track for pre-mastering, I realised during a micro-editing session that some of the effects, transitions and arrangement needed to be re-edited significantly enough to deviate from the original guide track and stems used in the Pink Studio recording session. Alek had made a few timing errors that, against the live bassline, sounded natural and tight, but, when contrasted with the unforgiving metronome of the dance track, they stood out noticeably. The acoustic drums simply had to be edited to match the precision of the micro-edit. It was, therefore, necessary to adjust them to a grid in order for them to sit well with the electronically programmed material. I imported all acoustic drum stems from the Pink Studio recording session into Logic Pro 9 and grouped them (minus kick in and kick out stems). Once grouped, I phase locked the tracks – this allows edits on one track to be mirrored on all tracks in the group without affecting phase. I then set about “flexing” the drums. I used the Top Snare transients as an audio/visual guide and made the adjustments on this track as minor as possible to retain the groove of the original performance. Roughly one thousand six hundred markers were placed and adjusted over the duration of the 08:03 length of the track – averaging eight markers per bar (Fig. 2). Fig 2 Flexing Drums in Logic Pro 9 with phase locked groups. Once I had flexed the acoustic drums, I added very mild equalisation to control some room/snare resonances at around 200 and 400 Hz. I then bounced them to a stereo track and placed the new “Flexed Drums” stereo stem into the original remix project file, along with the original LA2A live bassline stem, and bounced them with all the edited, leveled, audio, MIDI, and EFX tracks to a single stereo track with peak levels averaging -3dB to allow headroom for mastering by the label. Run through the SSL Desk and an LA2A leveling amplifier and re-recorded back to protools (4th Generation). By the time the live bassline reaches the Yamaha (5th Generation), and is mixed and/or bounced either in Pro Tools, or re-recorded back to tape via Yamaha Desk Stereo output on Channels 15-16, we are looking at minimum 6th generation processing of the audiofile. The GT stems too would now be 3rd Generation. Flexed Drums (SSL/Pro Tools>Logic 9>Flexed>Bounced>Imported) – 3rd generation. SSL/LA2A live bassline – 4th generation. This combination afforded the least amount of necessary audio manipulation towards the end project, and is the main reason I chose to submit this mix to the label for commercial release. Knowledge of my home studio’s acoustic environment and my monitor set up were also huge factors in this mix decision. To meet final recording criteria – record two acoustic instruments through SSL at Pink Studio and mix final result in Digital Studio at the SAE campus – I prepared a final set of stems comprised of stereo stems derived from the original remix project file in Logic Pro 9 (Electronic Drums, Harmony and Wet/EFX ), the original bounced acoustic “Flexed Drums” stem, and the original SSL Mix Bus B/LA2A live bassline stem from the SSL/ProTools session. The Raw Mix (Acoustic Drums and Bass). This mix excludes the electronic drums and synth kick. Electronic and Flexed Drums were sent via Aux 1 and 2 to on board EXF patches “Early Reflection” and “Mid Sized Plate” reverbs respectively. I customised each reverb by adjusting their respective room sizes and densities to create two specific “spaces” for Aux feeds. A very small “office” space to add a midfield presence in the mix on Aux 1, and the plate to add a sense of depth behind the mix on Aux 2. No outboard gear was used to avoid further audio A/D D/A conversions. Finally, I lightly equalised and leveled on the desk and recorded down to a stereo track on Pro Tools HD 9 via Channel 15-16 on the Yamaha. 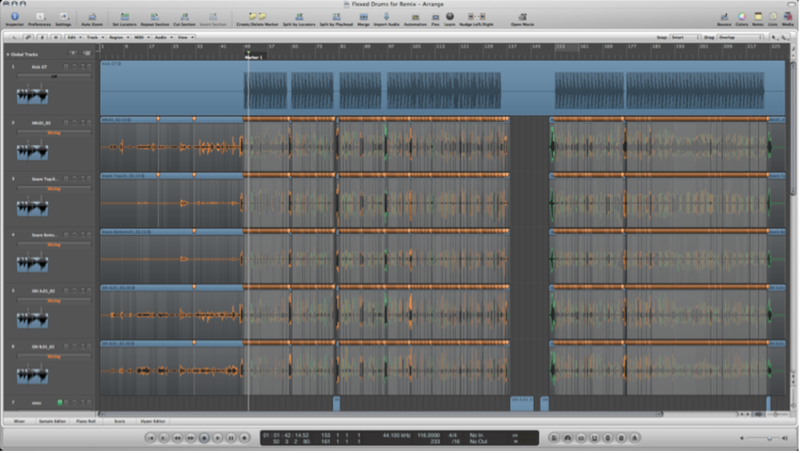 This mix, the mix submitted for final examination, is a Pro Tools HD “in the box” mix performed on campus at SAE. The decision to mix in the box came after extensive listening and testing via side by side comparisons of various recorded material mixed and bounced via the Yamaha desk and from within Pro Tools HD itself. From this extensive listening and testing it is clear that a subtle but significant amount of depth and clarity (and specifically “air”) is lost via the Yamaha recording to Pro-Tools via Channels 15-16 patched to Stereo Output from the desk. The “in the box mixes” consistently retained the most accurate translation of the final mix “to tape”. It is, in my opinion, that, due to the number of generations of audio files being mixed (as discussed above), using the Yamaha as a further signal path became counter productive to the overall sonic quality of the project and could add nothing more of value to the sound. The decision therefore to mix and bounce audio via the Pro Tools HD system made the best solution for maintaining the digital integrity of the files so far produced. Sends were then routed from the Flexed Drums, Electronic Drums and Harmony channels at varying levels into each of the reverb “sends” and balanced against the overall mix and original wet/efx stem. This was then bounced to disk with dithering to 16 Bit 44.1Khz from 24 Bit 44.1Khz and prepared for transfer to CD. The final, full version with acoustic drums, live bass and electronic drums. The full version, with acoustic drums and live bassline, will be released on the CD compilation, and the other versions will be used as extras and promo material for various PR and sales campaigns online. While all this seemingly extraneous production may seem exorbitant, it is a long established workflow of mine and part of a creative process that allows me to flush ideas and concepts into, or out of, the way. Splitting the workflow into simultaneous threads actually allows me to concentrate on what the project really needs, rather than trying to cram several ideas or processes into one piece of music and getting stuck. As mentioned above, I had already produced two remixes of the same material that were cannibalised for this third and final iteration of the remix and it was these two earlier remixes that fueled the content and ideas for the final project. Final thoughts on the recordings. The drum sound could be much improved by even closer attention to mic placement. The overheads could have been significantly lower and, perhaps, I should have individually close miced the toms to have more flexibility in the mix. The snare, too, could have done with a closer snappier snare bottom and, ultimately, I find the drum recording to be quite thin and somewhat lifeless as a stand alone recording. That said, however, I find that recording drums with the fixed intent of mixing down on the SSL desk did me a great service in that I had the drum sound sitting well in the mix from the very beginning. There was ultimately very little equalising to be done, except for a pesky snare resonance in the room at around 200 and 400 hz and a bare minimum of compression to glue the acoustic drums to the track. The acoustic drums fill out the “mid mix” of the track which was the exact intention of the mic placement in the first place, and sonically they compliment the track without appearing to be “stuck into the mix later”. The live bass recording was rich and warm from the outset so when the composited bass line was run through the SSL and LA2A it only served to enhance the sound and the bass never fought to be anywhere in the mix. It ended up taking a leading role in the arrangement as a result. The project put an amazing array of resources at my disposal and I am pleased to have worked with my colleagues from school, who were invaluable to me at both recording sessions, and, of course, to have worked with Mr. Vasic and Mr. Petrovic. Credit too, must go to Aural Imbalance, aka Simon Huxtable, for providing both inspiration and pristine audio files to work with in the first place and for putting together an amazing remix package from artists all over the world.